ABSOLUTELY BEAUTIFUL!!! THIS LIGHT MADE THE ROOM PEFECT!!! SO HAPPY WITH THIS PURCHASE. Brightly colored fabrics, gauzy shades, and beachside pads spring to mind when one sees the Zander 3 light wood bead semi flush light! The 18-inch tall light is comprised of a circular mount and a short support rod that attaches to the ceiling. The lights are slightly obscured by the white wood beads that drape down the sides of the light, meeting directly in the middle at the bottom of the lights. The beads add a soft elegance to the light, creating a fixture that would be at home in any bohemian living space. The white beads and brushed steel finish pair together for a light that would be perfect in a brightly colored bedroom or a well-adorned living space with knick knacks from across the world. Dimensions 15.94 In. X 15.94 In. X 17.13 In. 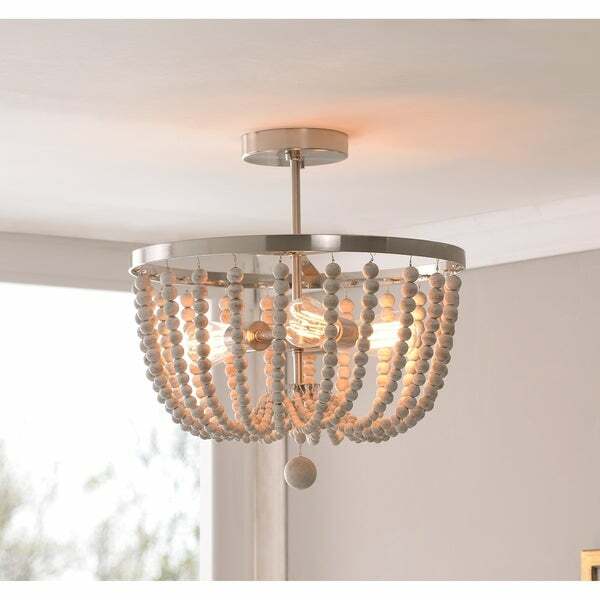 This light adds a glam/boho touch to our master with its metal finishes and wooden/rustic beads. It was hard to find a "boho-esque" light fixture that is semi flush mount and affordable. It was an easy install, and looks so great in our room. We used LED Edison bulbs to add flair, and overall, this light just exudes personality. Wonderful light fixture. We bought it for our girls room and it adds the perfect little touch of bohemian which is exactly what we wanted. Also with the wooden beads it’s not too “girly” which is what we were aiming for. Easy to install. Beautiful in person. It's a statement piece without being overly feminine. Wood beads have a nice finish to them. Would definitely buy another. Got 2 of these and hung them down a hallway. They look great. Only reason I'm giving it 4 stars and not 5 is because the beads are definitely off white/cream in color. I don't mind it but if you're looking for true white then you wouldn't be happy. Beautiful light fixture! Goes great in our Florida home. Two hooks missing to connect the bead string to the fixture. My hubby solved it using wire thread. I would think the company would have provided "extra" hooks. This is such a beautiful addition to my guest bedroom. The price was so reasonable too. My brother installed it in 30 minutes. The size is great for a smaller room with lower ceilings. "How tall is the light? The lengths listed in the description are not consistent"
This is 19 1/4 inches in height with put all together. I hope it helps.